The Chinese established the world’s first meritocracy — a bureaucracy based on skill and education rather than birth, property and bloodlines. This system was considered key to Imperial China's success and longevity. Emperors and kingdoms came and went but Chinese civilization remained in place as a result of the well-organized administrative system run by scholars-bureaucrats. The Emperor needed the Confucian bureaucrats to administer his realm and the Confucian bureaucrats needed the Emperor for employment and legitimacy but there was always tensions in their relationship. The bureaucrats feared the despotic tendencies of the Emperor and the Emperor feared the bureaucrats would turn on him and favor the people rather than him. 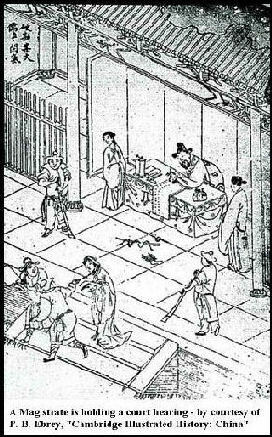 Many Confucian bureaucrats operated as local leaders. They served as links between the masses and the Emperor and often functioned as landlords and tax collectors. When times were good the system worked well but when times were bad---as a result of corruption, natural disasters or war---the relations between the bureaucrats, the people and the Emperor became strained. Sometimes the system collapsed and a period of disorder and chaos persisted until strong leadership emerged and the system could be restored. Under this system China changed very little. The government was unresponsive and unrepresentative of the people and was concerned with control and order. It had little contact with the people it ruled. Many would say the same situation exists today. 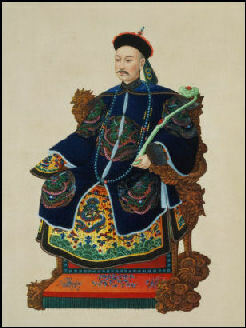 The scholar-bureaucrats who ran the Chinese imperial government were known in the West as Mandarins (a term coined by the British, which is viewed as pejorative and out of date). They were China's best and brightest, and served the Emperor in the imperial court and as imperial magistrates and representatives in the hinterlands. Scholar-officials worked hard: 10-day work weeks and work days that often started at 5:00am. They oversaw the regulation of trade, managed the money supply, maintained security in the provinces, and settled legal disputes. Scholar-officials were well rewarded for their work. They enjoyed lavished banquets several times a week and often lived in luxurious homes with their own concubines and entertainers. During the Qing dynasty, members of the court and the bureaucracy displayed their rank with decorative patterns and precious metals and gems worn on their costumes. The formal over-robe worn at court by a first degree civil servant, for example, was embroidered with a crane while that of a second degree civil servant was embroidered with a golden pheasant. The clothes of lower ranked officials were decorated with embroideries of other animals. Status for high officials was also indicated by the number of porters that carried their sedan chairs. During the Qing Dynasty officials of the top seven levels used sedan chair carried by four porters. Princes were transported in ones carried by eight. The Emperor and his mother were allowed 24. Generals and other military leaders were not granted this privilege. Some argue the scholar-officials reached their peak under the Song Dynasty (960-1279). 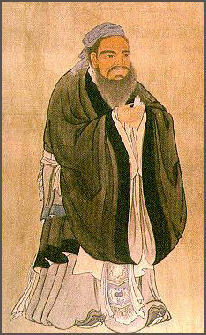 The founders of the Song dynasty built an effective centralized bureaucracy staffed with civilian scholar-officials. Regional military governors and their supporters were replaced by centrally appointed officials. This system of civilian rule led to a greater concentration of power in the emperor and his palace bureaucracy than had been achieved in the previous dynasties. The northern Song dynasty emphasized "orderly and virtuous governance, achieved largely through efficient bureaucracy staffed by mandarins who passed the rigorous state examinations...the revival of Confucian teaching gave a particularly strong moral flavor to the dynasty." The highest position in the scholar-bureaucracy was occupied by the prime minister, who, because he had risen by merit from the common people, was viewed as "a check on the whims of the Emperor and on the influence of the palace clique." During the Ming dynasty the power of the emperor was strengthened by giving him the power to dismiss any prime minister who opposed him. Messages sent with the bureaucracy were sealed memorials delivered at lightning speed. They took the form of communications between officials of equal rank, bonds, communications between government offices, statements, dispatches, memorials to the Throne, registers, career records and other documents. It was a Chinese tradition that senior scholar-officials make their views known by praise or condemnation of a piece of literature; it was a favorite tactic of Mao's. Practitioners of Confucian values, the Emperors and the ruling class thumbed their noses at the merchant class and rebuffed Western attempts at trade. Selections from “Meritorious Deeds at No Cost: Scholars”: “1) Be loyal to the emperor and filial to your parents. 2) Honor your elder brothers and be faithful to your friends. 3) Establish yourself in life by cleaving to honor and fidelity. 4) Instruct the common people in the virtues of loyalty and filial piety. 5) Respect the writings of sages and worthies. 6) Be wholehearted in inspiring your students to study. 7) Show respect to paper on which characters are written. 8) Try to improve your speech and behavior. 9) Teach your students also to be mindful of their speech and behavior. 10) Do not neglect your studies without reason.